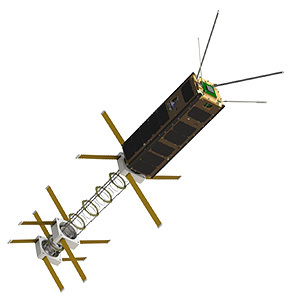 ICE-Cap (Integrated Communications Extension Capability) is an experimental communications 3U CubeSat developed for the US Navy. US Navy's PEO Space Systems, with support from SPAWAR Systems Center Pacific, is developing the ICE-Cap satellite. The Army Space and Missile Defense Command (SMDC) provided the satellite bus (SMDC-ONE), which was built by Space Micro. The payload was provided by different contractors: the UHF software defined radio by Vulcan Wireless, the High Assurance IP Encryptor by InnoFlight, the high gain antenna by Physical Optics Corporation, the Omni antenna/Bus Integration/Flight Computer by Space Micro and the flight software by SSC PAC. After launch in 2016, the system will demonstrate the ability to communicate through the Mobile User Objective System (MUOS) to send data directly to users on secure networks. ICE-Cap also will show the ability to relay communications from a user near the North Pole to another user halfway around the world.